What makes bamboo lumber a green product is that it is actually a grass and not a hardwood. It is a highly renewable product because it can be harvested every six years from the same root system without the need for replanting. To use the bamboo as a building product, the six inch bamboo stalks are diced up into cubes, then cut into strips. These strips are then processed by boiling and bug proofing, and then laid up into lumber and plywood. The two types of bamboo lumber are vertical and horizontal (sometimes called flat). Vertical bamboo looks like vertical grain fir or pine. All of the strips are arranged on their sides in a vertical fashion. The nodes (growth rings) tend to show up as little eyes similar to the spots in Birds Eye Maple. Horizontal has all the strips lying flat so that you see the nodes, giving it a more striking bamboo appearance. 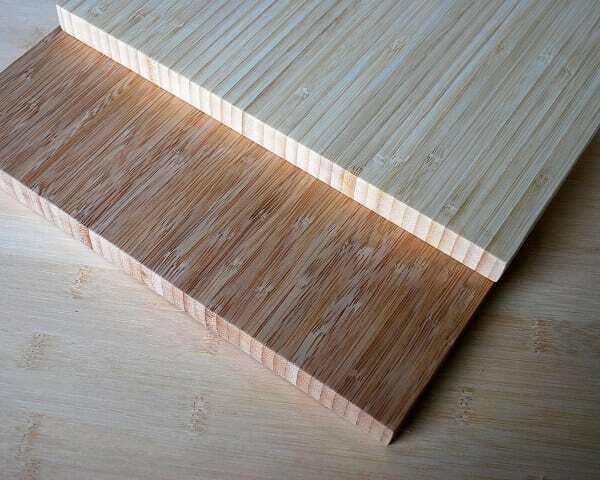 Bamboo lumber comes in two colors: natural and carbonized (sometimes called caramelized). Natural is a blondish, butter color. Carbonized is closer to honey. Most carbonized bamboo will be a medium brown. The darker browns are usually a custom color from a specific manufacturer. We stay with one manufacturer so that the color from container to container will match. Whatever you can do with a hardwood, you can do with bamboo. A comparison would be similar to working with Cherry. It won’t split like wood, as the grain is more linear, but you can chip off pieces if you get too big of a bite with a router. It’s very hard so it will dull blades and bits quicker. Due to the tightness of the grain, we suggest pre-drilling screw holes before running screws in for hinges and such. When planing material, you may experience some chip out at the nodes if you try to take off too much at one time. With a little caution, there’s shouldn’t be any major surprises. Standard finishing practices work well with bamboo. Water borne polys over a sanding sealer work well. Lacquers and oil-based polys like Seal-a-Cell also work well. Bamboo will stain differently than wood. Better safe than sorry. Always try any finish you buy on a scrap piece first. Your bamboo panels and lumber will require the same protection from the elements as your other wood products. If you have room you should just leave it wrapped up until you are ready to use it and laying flat would be best. If you have sheets that have been unwrapped, storing them flat with another wrapped sheet resting on top or get some plastic sheeting to cover it with. If you have any questions regarding our company or our bamboo products, please contact us at 503-695-3283 today. Northwest Bamboo, Inc. provides bamboo construction materials including bamboo lumber, bamboo veneer, bamboo flooring, and more to clients worldwide.